"To be able to enjoy one’s work in life, is to be blessed." I am indeed blessed to work with many wonderful people, some of whom are competitive and ambitious, and some of whom are not ambitious for the competition arena, but still devoted to their horses and committed to being better horsemen and riders. To each and all, thankyou for instilling the trust in me to guide you on your journeys. Bring on 2019! 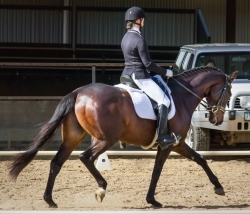 I’ve had the priviledge of working with Kristen, a fellow dressage coach, since she was a teenager with her thoroughbred gelding Cookie. Together, we took her beloved BD Bellissimo from Preliminary to Grand Prix level, before she tragically lost him well before his time. 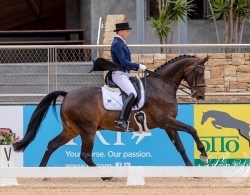 Siriano (by Sir Donnerhall) is the second product of our training partnership, and they have had much success together, including winning the 2016 QLD State prix St George Championship title; And many times selected on the QLD State Dressage Squad. Kristen has made the difficult decision to sell Siriano to make some property improvements. 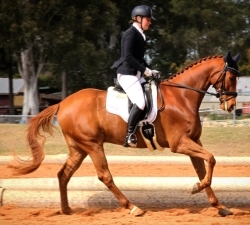 Kristen has started a third young Warmblood, Crystalbrook Platinum (by Prestige VDL), and they have had two wonderful seasons together. 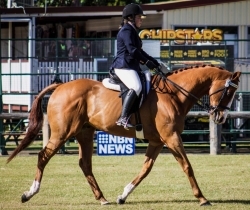 This year winning the Reserve Novice Championship at the Brenda Wittman Classic and were finalists for QLD Novice Horse of the Year. We look forward to pushing on in 2019 towards Elementary. I have been training Daisy for four years. In this time, Daisy has impressed me with her commitment to training and being as good as she can be. She is super committed, patient and loves everything about the sport, from early mornings, to cleaning gear and mucking boxes. Daisy also purchased from Remi Stud her future star Remi Lanikai, now a 2 year old gelding by Lauries As, out of Champion mare Fioretta. I have been working with Charlotte since she was 12 years old. Starting with her stunning Welsh Cob, Castlebrook Brenin Jude, Charlie has always impressed me with her dedication and attention to detail. This dynamic duo has come a long way since 2016, achieving more personal bests to count! 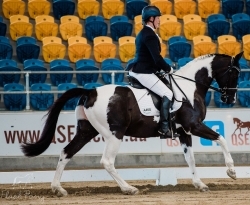 At the beginning of 2019, after the tragic loss of her new horse, Calimero, Charlotte moved onto the reliable FEI schoolmaster, Jazzaround. We look forward to their learning journey. Marian started 2018 with a new horse, North Carlos. 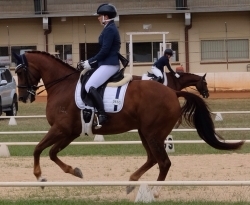 In a short time, they bonded and were achieving Marian’s personal best scores every time they went out, and winning many AAOR Elementary places, including the Caboolture AAOR Spectacular Elementary Championship title. 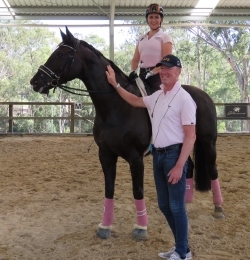 Together, they also won a Dressage QLD Bronze Medal and a Masters Challenge Award in 2018. Tragically, we lost our beautiful Carlos to a strange auto-immune disorder in September 2018. 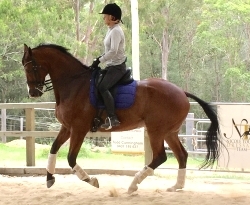 After much grief, we were lucky to have Champion Dressage mare, Jaybee Angelina (by Alabaster), come into Marian’s life. 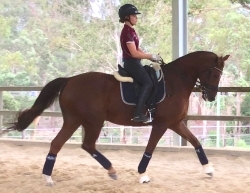 An FEI schoolmaster, I hope she is perfect for Marian to learn the higher movements on, and we are looking forward to the coming year very much. Karin enjoyed another year of learning from her beatiful imported schoolmaster Fidelia. 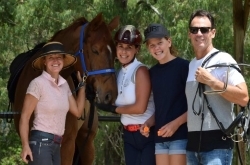 With a busy home life and a very busy athletic daughter, Ella, Karin loves her ‘down time’ and looks forward to every chance she gets to ride and train; soaking up the challenges that come with improving in the sport. In 2018, Karin mastered the flying changes, and we look forward to putting more together in 2019. 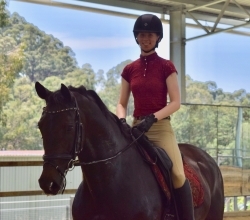 Emma Weel, was a student of mine as a teenager, and returned to the saddle in 2018 after more than 20 years away! 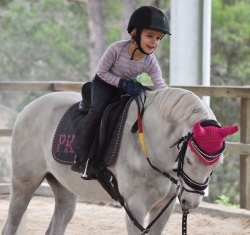 Prior to re starting her riding life, Emma had competed up to Pony Club Novice level. 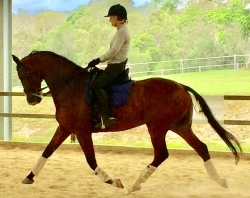 Finding FEI schoolmaster, Jazzaround (by Jazz), has been a life changer for Emma, and she cannot get enough of riding. 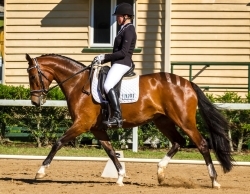 With a downgrade, Emma competed at Elementary and Medium level and won many AAOR Elementary and Medium Championships, achieved a Dressage QLD Bronze Medal and was a finalist for QLD Newcomer Rider of the Year. 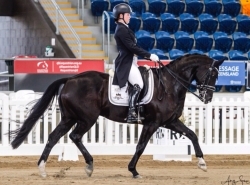 In early 2019, Emma purchased exciting Australian Champion, Santiago, from Matthew Dowsley. It might be a while before Emma competes on her new V8, but Emma will love every step of the journey. I started to work with Dean at the Caboolture clinics in 2017, and we made some wonderful progress towards Dean’s goals. 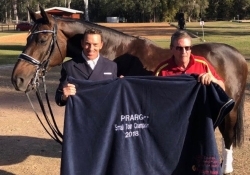 In 2018, those goals came to fruition, with Dean achieving a National Performance Gold Medal, Dressage QLD Gold Medal, QLD State Reserve Small Tour Champion and Runner-up QLD Small Tour Horse of the Year. 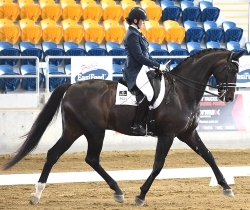 Dean and Salmour have also been selected on The Saddlefitter 2019 QLD State FEI Squad. I look forward to helping Dean progress towards Grand Prix throughout 2019. 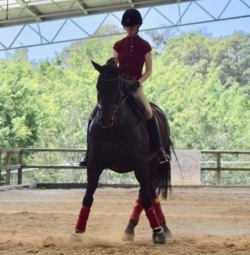 21 year old Macada started working here at Nicole Tough Dressage Team in 2018, and also began regular lessons. 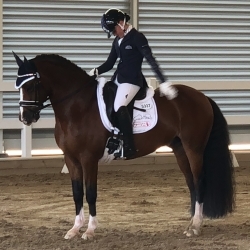 Macada returned to the competition arena for the 2018 QLD State Dressage Championships for a 64% and an 8 th placing in the 3.2. Macada was lucky enough to get new horse, Vrai Amie (Regardez Moi/Aachimedes), late in 2018. A lovely rider, Macada is looking forward to achieving many goals in 2019, and I look forward to helping her meet them. Macada is a wonderful addition to the NTD team and loves all the horses here at the barn. She is also a wonderful photographer - which is a bonus for me! 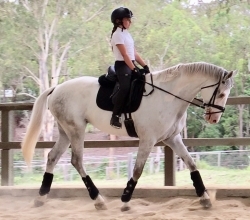 12 year old Zali Young and her young warmblood, ‘Blue’, have come so far in a short time, mastering a rounder frame and more dressage skills. 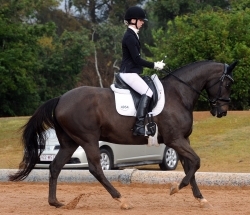 Zali is a talented show jumper who sees the merit in training on the flat to develop her horse into a better athlete. I’m looking forward to transforming this dynamic duo. Sarah has been one of the regulars at the Caboolture clinic, and working with her is a delight. 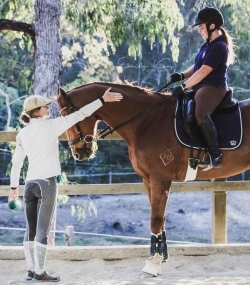 Sarah is a gifted rider and loves achieving a better feel. 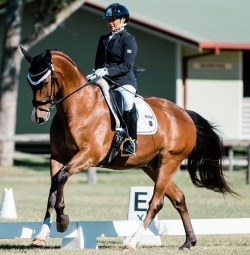 Sarah has had much success on the Dressage QLD AAOR Series Leaderboard in 2016 and 2017 with her beloved ‘Elvis’ and won their debut Advanced test at Samford * Dressage in June 2018 with 67%. 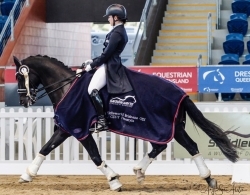 Tragically, it looks like Elvis may not return to competitive dressage after a mystery accident caused some neurological damage… I hope 2019 takes a better turn for the wonderful Sarah Hancock. 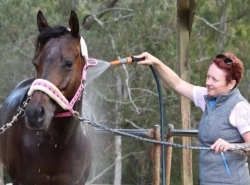 After a roller coaster couple of years, Kirsten and hubby have moved into their new home, and is loving her working life at Horseland - Strathpine. 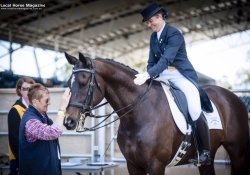 Kirsten and her young Hanoverian, Remi Lone Ranger (by Lauries As), have had a great year competing when they can, at Preliminary and Novice level, and enjoying some great scores. I look forward to helping Kirsten set new goals and work towards them in 2019. 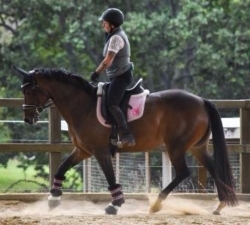 Kaitlyn started working here at Nicole Tough Dressage Team in 2018, and enjoyed her first ever dressage lessons, on her OTTB, Prince. 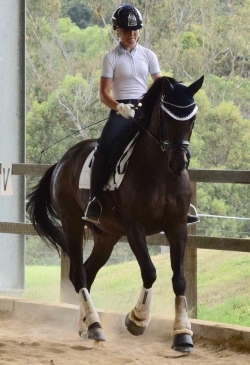 Together, they have learnt how to start using the upper line muscles (Dorsal), and achieved much success at a few local Shows, winning Maiden Hack, Novice Hack and Lady Rider classes. Kaitlyn is a terrific worker, a fantastic addition to the NTD Team and looks after the horses here at the barn impeccably. 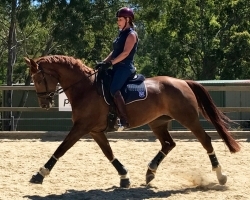 Also part of the regular Caboolture clinic crew, working with Kerry Higham and her Australian Warmblood pinto gelding Kah-Mah Supremacy, is always fun. Kerry loves her lessons, and rain, hail or shine, she will be there. Helping Kerry to overcome some confidence issues and achieving personal best scores thoughout the year has been very rewarding. 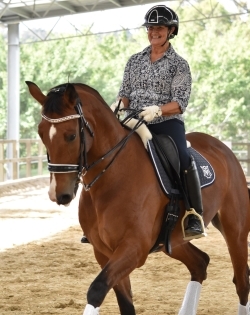 I’ve had the pleasure of teaching Anna for many years with many various horses, a few favourites being Ava and Lurch. 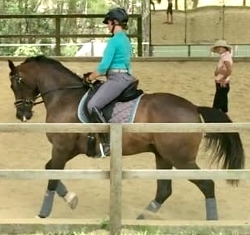 Am now looking forward to helping Anna with her new horse, Revelwood Jukebox, a 17 hand, 11 year old gelding by Jive Magic. 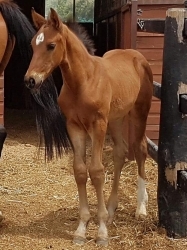 Kris came to me early in 2018 wanting help to start her 5 year old, 14.1 hand, pony mare Willow, with the hope of starting Pony Dressage when they were ready. I look forward to helping Kris get in the competition arena in 2019. Definitely my youngest students, 6 year old Mila and 8 year old Abby, are loving learning about how to look after and ride their ponies. 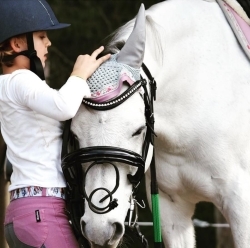 They have had their share of falls, went to their first Pony Club Gymkhana, winning many ribbons and LOVED a few Pony Club Camps. I look forward to helping them on their pony journey through 2019.